The BBC has rejected claims of "bias" after it moved live filming of Question Time from Bolton to London.The programme said Thursday's show was broadcast from Dulwich to allow politicians attending Brexit debates at Westminster to take part.Some social media users said moving filming from Bolton, where 58% voted to leave the EU, ensured a pro-EU audience in London, which voted to remain.The BBC said it was looking for a new date to return to Bolton.The live weekly BBC One debate, which allows audience members to question a panel of politicians, journalists and public figures, had been due to air from Bolton's Albert Halls. Some Twitter users took to the platform as the show aired on Thursday to say a panel comprising northern politicians should have been sought if MPs were unwilling to travel from London. Others suggested the BBC was guilty of "demographic management" and "bias". One said the BBC had "dumped" filming in front of a Bolton audience in favour of London because it did not "want to hear their opinion". 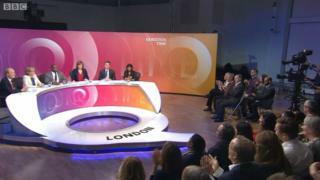 The panel of guests included Tottenham MP David Lammy and Culture Secretary Jeremy Wright, the MP for Kenilworth and Southam in Warwickshire, who were joined by journalists and an MEP.The BBC rejected suggestions moving the show was related to the way Bolton voted in the referendum.A spokesman said: "The decision was taken at the start of the week when it was extremely unclear when and if crucial Brexit votes would be taking place. "If there had been voting on Thursday, politicians would not have been able to get to Bolton." What links Question Time to Robert de Niro? The programme is currently inviting prospective audience members to apply for live episodes due to be filmed in Nottingham on 25 April, Warrington on 2 May, Northampton on 9 May and Elgin on 16 May.It is not due to return to London until 20 June.